Twenty children from key stage 2 took part in the local cluster 5-a-side football festival on Friday 22nd April. Two teams from years 3/4 and two teams from years 5/6. It was a cold, windy day at the football fields but the players couldn't wait to attend the competition and display their footballing skills. The teams displayed talent, determination, teamwork and sportsmanship throughout the competition and we were very proud of all them. A big well done to everyone who took part. 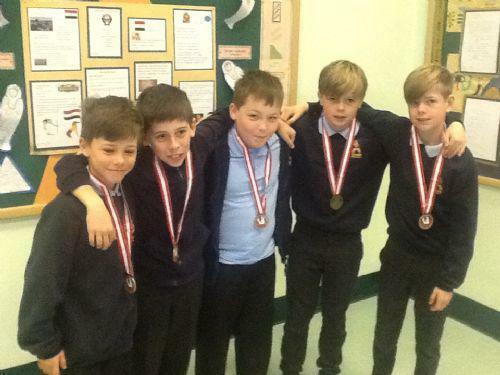 Here is a picture of the Y5/6 winning team after receiving their medals in assembly.